As the temperatures drop and Newport settles down for winter hibernation, we’d like to remind folks that Newport is a city with a lot of people crammed very close together. It wasn’t that big of a deal back in the summer when you were out until 3-4am because you hit a couple after-hours after watching The Ravers, but now people are coming home after work and just staying there. All of a sudden, you get to know your upstairs (and downstairs) neighbors very well as everyone is spending a lot more time at home. You get to learn all about their musical tastes, what they’re watching on Netflix and the duration and intensity of any copulation they might engage in. 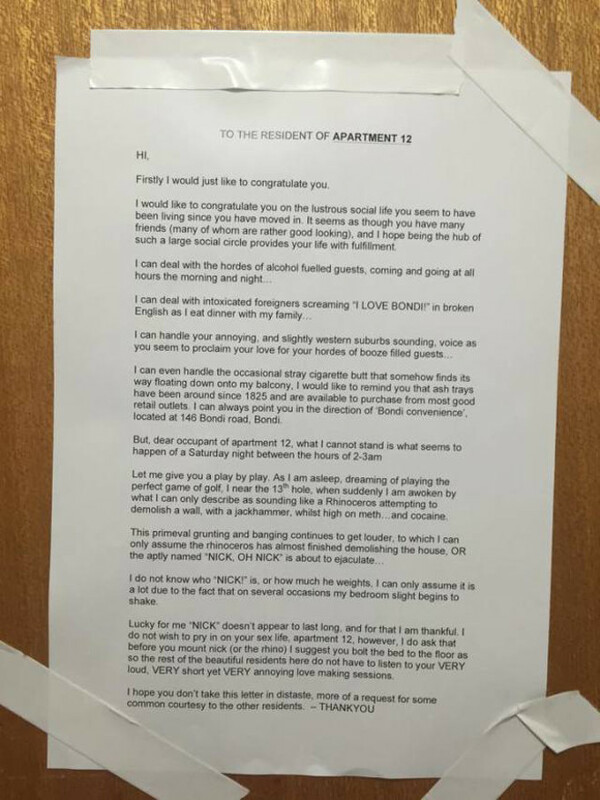 With any luck, you won’t have to leave a passive-aggressive letter (like this one found on Reddit) and no one will leave them for you. At the very least, please keep your rhinoceros out of your stash of meth and blow.